If you have ever been tempted to purchase one of those seed packages promising an instant meadow garden, you will benefit from doing a little research first. One of the sources you might consult is Sowing Beauty—Designing Flowering Meadows from Seed by James Hitchmough. Professor Hitchmough heads the Department of Landscape Architecture at Sheffield University in the United Kingdom. 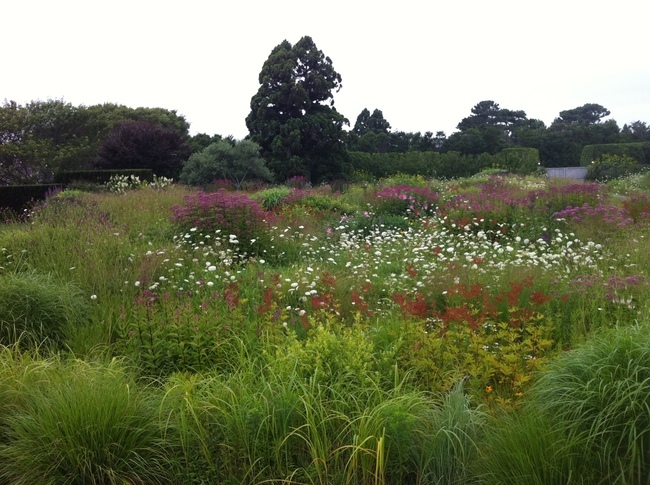 In Sowing Beauty, he shares what he has learned about growing meadow and meadow-like gardens from seed based on 30 years of university research and practical applications in public and private settings. Even though Hitchmough’s research and many of the gardens he has designed and implemented are located outside Plant Hardiness Zone 7, many of the technical issues he addresses such as seed mixes, sowing techniques, and maintenance are applicable anywhere. Sowing Beauty starts by describing the many types of meadow gardens found across the globe and the characteristics of each. Next it discusses “selecting the right plant for the right place” (what Hitchmough calls “developing an ecologically informed planting concept”). He covers site analysis (e.g. sun, shade, soil PH, user objectives) and matching plants to local growing conditions. The book also highlights other factors that impact the ultimate success of a meadow planting, including plant size and shape, methods of spreading, flowering duration and capacity to support native animal biodiversity. The following chapters cover the technical aspects of creating meadow gardens, starting with seed mixes (your own or commercial) and moving through site preparation, when and how to sow, and short- and long-term maintenance, which is critical for managing weeds. The book also includes practical tools. For example, there are sample decision-making tables for deciding what to plant and how many seedlings or plants are needed per square meter of garden. Another table lists (for 600 varieties of plants) the number of plants likely to grow from a set amount of seed under different watering conditions and how palatable the plants are to slugs. (Slugs can be devastating to certain meadow garden plants). Sowing Beauty concludes with a series of case studies of sown prairies, meadows, and steppe plantings, including several using North American prairie plant communities. Each case study describes the history and design approach to the planting, lists the plants used—whether seed mixes or actual plants—and explains what worked, what did not, and why. The photographs showing the various stages of the gardens over time are particularly interesting. There is also an extensive reference section which includes a metric conversion chart (all the measurements in Sowing Beauty are metric) and a list of seed sources both within and outside the United States. Sowing Beauty is not the only book a Mid-Atlantic gardener might want to consult before attempting to plant a meadow garden. However, it would be a significant resource (and reality check) for anyone interested in creating a sustainable meadow garden from seed. Sowing Beauty (Timberline Press, 2017) is available from its publisher and national booksellers. The list price is $39.95. Local meadow gardens open to the public include the André Bluemel Meadow at River Farm, home of the American Horticultural Society in Alexandria, Virginia and the Meadow Project in the “dimple” in front of the Filene Center Box Office at Wolf Trap National Park for the Performing Arts. Stay tuned to this site for a future article on the Meadow Garden at Longwood Gardens located in Kennett Square, PA.
Panorama of Meadow Garden at Longwood Gardens. 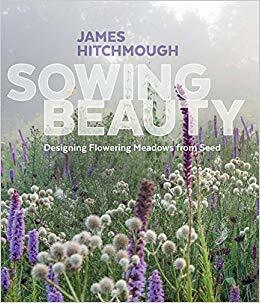 This entry was posted in The Master Gardeners' Bookshelf and tagged Flowering Meadows, James Hitchmough, Sowing Beauty. Bookmark the permalink.